Union Film or the Projektions-AG Union (PAGU) was a German film production company which operated during the silent era between 1911 and 1924. The company was founded by Paul Davidson, a leading cinema owner who branched out into production. One of his first major coups was signing up the Danish film star Asta Nielsen for a lengthy contract. A rising star of the company was also the actor-director Ernst Lubitsch who made a series of comedies for Union Film. From 1917 onwards the company functioned as an independent unit of Universum Film AG (Ufa), and was eventually merged into it entirely. German small photo for the album by Dr. Oskar Kalbus, Vom Werden deutscher Filmkunst, Vol. I, Der Stummfilm (Cigaretten Bilderdienst, 1935). Photo: PAGU. 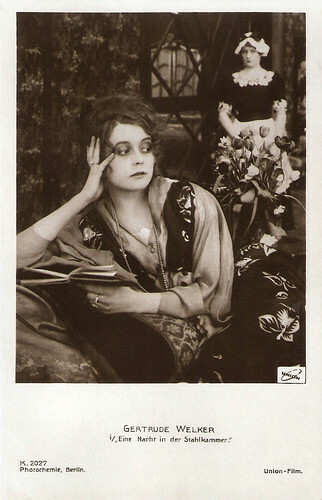 Asta Nielsen in Engelein/The little Angel (Urban Gad, 1914). Erna Morena. 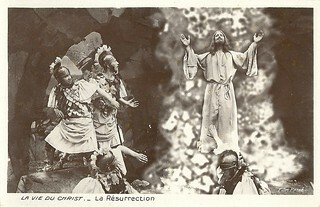 German postcard in the Film Sterne Series by Rotophot, no. 79/5. Photo: Karl Schenker, Berlin / P.A.G. Union. Collection: Didier Hanson. German postcard by Photochemie, no. K. 1983. Photo: Union Film. 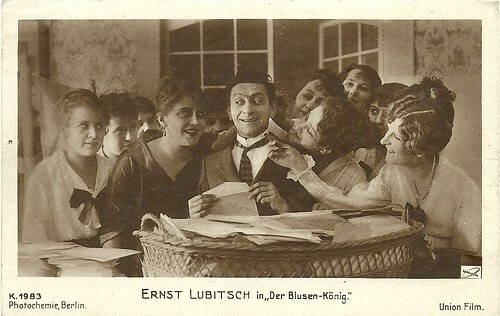 Ernst Lubitsch in Der Blusen-König (Ernst Lubitsch, 1917). Collection: Didier Hanson. German postcard by Photochemie, Berlin, no. K. 1986. Photo: Union-Film. 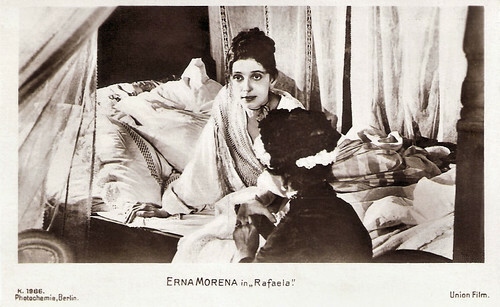 Publicity still of Erna Morena in Rafaela/Wer weiss? 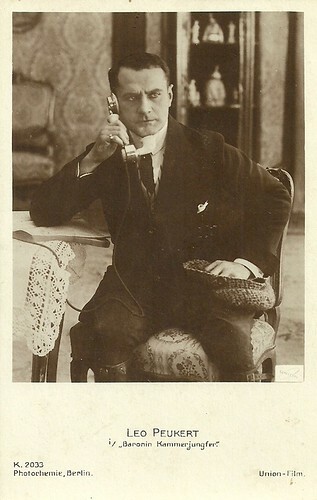 (Arsen von Cserépy, 1917). German postcard by Photochemie, Berlin, no. K. 1990. Photo: Union Film. 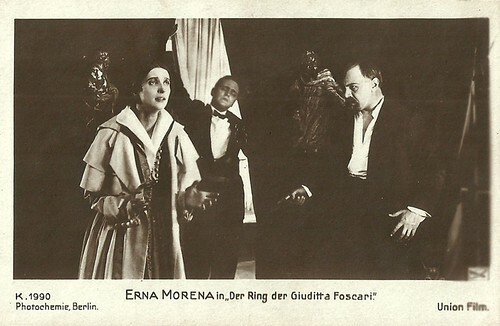 Erna Morena, Emil Jannings and Harry Liedtke in the German silent drama Der Ring der Giuditta Foscari (Alfred Halm, 1917). Paul Davidson (1867–1927) was born in Lötzen, East Prussia (now Giżycko, Poland). He was the son of Moritz Davidson. Paul initially worked as a commercial traveller in the textile industry and he became the manager of a security firm in Frankfurt am Main in 1902. On vacation to Paris, he saw his first film, a Georges Méliès production, in a cinema. Back in Frankfurt, he founded the 'Allgemeine Kinematographen-Theater Gesellschaft, Union-Theater für lebende und Tonbilder GmbH' (A.K.T.G.) on 21 March 1906 and opened Mannheim’s first permanent cinema, the Union-Theater (U.T.). Further cinemas followed in Frankfurt, Düsseldorf, Cologne, Strasbourg, Amsterdam and Brussels. Initially his company was based in Frankfurt, but in 1912, Davidson moved his headquarters to Berlin as it was clear that Berlin had become the centre of the German film industry. In 1909, Davidson transformed the A.K.T.G. into the Projektions-AG 'Union' (PAGU), the first publicly traded film company in Germany. A year later, he started Germany's first distribution company, renting rather than selling outright prints of the heavyweight championship boxing fight between Jack Johnson and James J. Jeffries. On 4 September 1909, Davidson opened the Union-Theater at Berlin, Alexanderplatz. Another, even more luxurious Union-Theater was opened at Berlin's Unter den Linden on 21 August 1910. By 1910 Davidson had built up a sizeable chain of 600–1000 seater luxury cinemas. In less than ten years, Paul Davidson had created an empire of over 56 cinemas in Germany, Belgium, and Hungary, drawing 6 million patrons in 1913. German postcard by Photochemie, Berlin, no. K. 1998. Photo: Union Film. 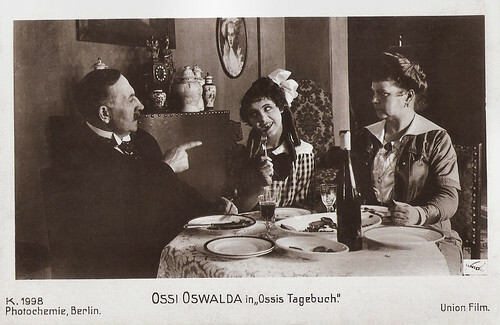 Ossi Oswalda in Ossi's Tagebuch/Ossi's Diary (Ernst Lubitsch, 1917). German postcard by Photochemie, Berlin, no. K. 2001. Photo: Union Film. 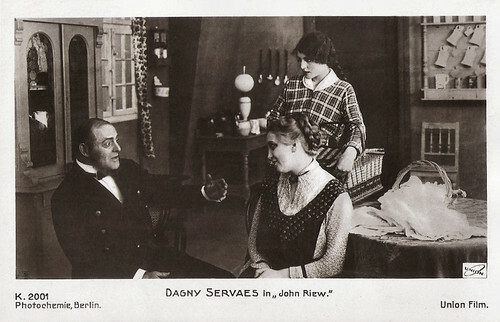 Publicity still for John Riew (Walter Schmidthässler, 1917) with Karl Valentin, Dagny Servaes and Käthe Dorsch. German postcard by Photochemie, Berlin, no. K. 2008. Photo: Union Film. 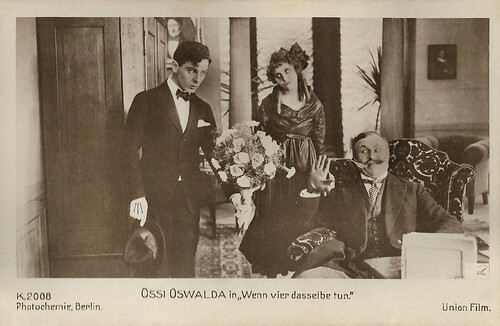 Publicity still for Wenn vier dasselbe tun (Ernst Lubitsch, 1917), starring Ossi Oswalda as the girl, Fritz Schulz (here on the left) as her lover, and Emil Jannings as her father (here on the right). German postcard by Photochemie, Berlin, no. K. 2012. Photo: Union Film. 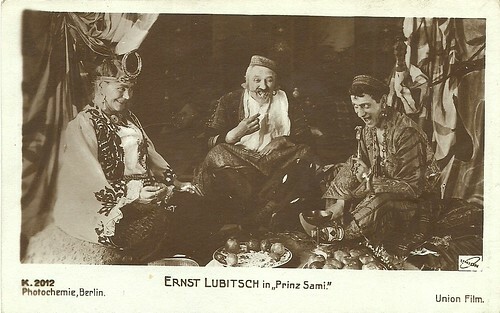 Ernst Lubitsch in Prinz Sami/Prince Sami (Ernst Lubitsch, 1918). Collection: Didier Hanson. German postcard by Photochemie, Berlin, no. K. 2027. Photo: Union Film. 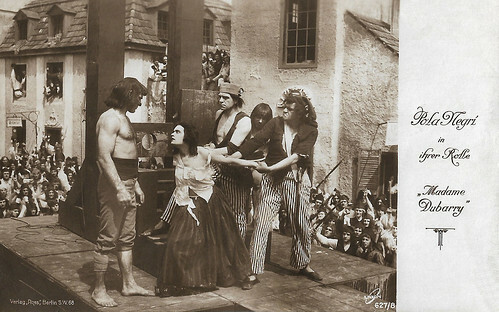 Gertrude Welcker in Eine Nacht in der Stahlkammer/A night in the steel chamber (Felix Basch, 1917). Paul Davidson had not been thinking about moving into film production himself, but then he saw the first Asta Nielsen film, Afgrunden/The Abyss (Urban Gad, 1910). He realised that the age of short film was past. 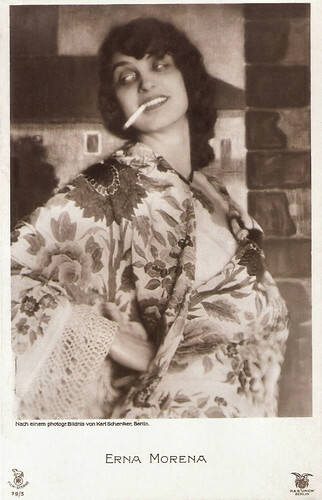 In Asta Nielsen he also saw the first artist in the medium of film. She was thus the decisive factor for his move to film producing. In March 1910, Paul Davidson founded the Projektions-Aktiengesellschaft Union (PAGU), Germany’s first joint-stock company in film industry and the first to integrate production, distribution and equipment hire. At the time, the majority of films being shown in Germany were foreign-produced, a situation which Davidson attempted to change. Following the success of Afgrunden/The Abyss (1910), he founded the Internationale Film-Vertriebs-Gesellschaft in conjunction with Asta Nielsen and her husband Urban Gad on 1 June 1911. The company held the European rights on all Nielsen films. Davidson instantly felt that the Danish actress could be a global success. 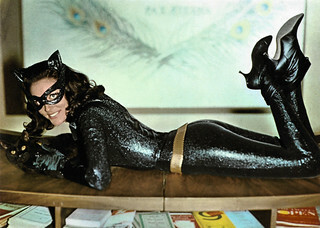 It was International film Sales that provided Union with eight Nielsen films per year. Davidson built her a studio in Berlin Tempelhof, later overlooking Berlin’s Tempelhof airport, and set up a big production staff around her. He was confident that Nielsen could carry it off. Davidson used every available means – and devised many new ones – in order to bring the Asta Nielsen films to the world. It was a success. Asta Nielsen became a sensational international film star with an annual fee of 85,000 Marks in 1914 alone. Davidson was also notable for his success in breaking a boycott of German playwrights, who were refusing to allow their works to be adapted for the screen. 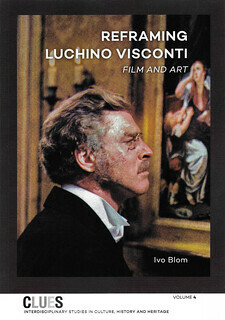 He was even able to persuade the leading German stage director Max Reinhardt to make two films, shot in Italy, for the company. On 2 August 1913 the Union-Palast, Kurfürstendamm, one of the first buildings of Berlin exclusively built as a cinema, premiered with Max Reinhardt’s Die Insel der Seligen/The Islands of Bliss (Max Reinhardt, 1913). German postcard by Photochemie, Berlin, no. K. 2765. Photo: Atelier Eberth / Union. 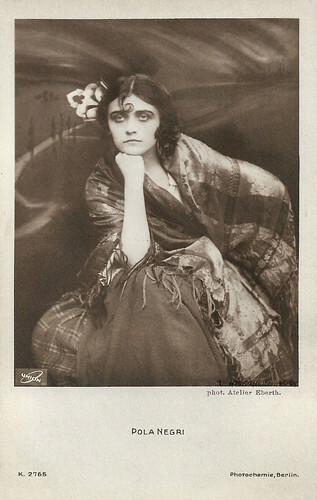 Pola Negri as Carmen in the German silent drama Carmen (Ernst Lubitsch, 1918). German postcard by Photochemie, Berlin, no. K. 2931. Photo: Union. Reinhold Schünzel in Das Karussell des Lebens (Georg Jacoby, 1918). 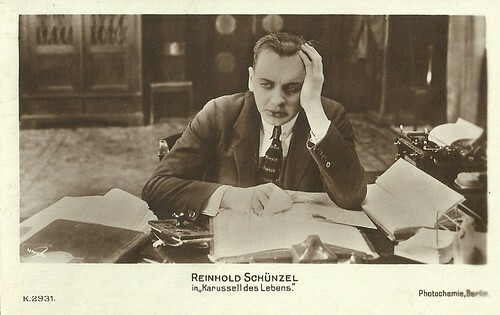 According to German Wikipedia Schünzel's presence in the film is unsure, but this postcard seems to prove it. German postcard by Ross Verlag, Berlin, no. 611/5. Photo: Union / Ufa. 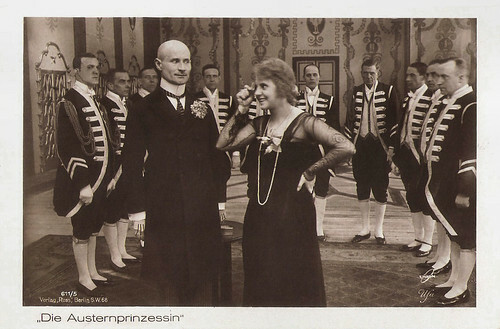 Julius Falkenstein and Ossi Oswalda in Die Austernprinzessin/The Oyster Princess (Ernst Lubitsch, 1919). German postcard by Ross Verlag, no. 614/1. Photo: Union. 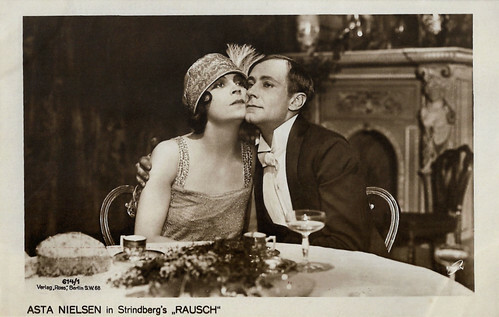 Publicity still with Asta Nielsen and Alfred Abel in Rausch/Intoxication (Ernst Lubitsch, 1919). A financial crisis at the beginning of World War I forced Paul Davidson to sell his cinema chain to the Danish Nordisk Film Company in August 1915. Davidson decided to focus on film production. His Union Film engaged such actors as Paul Wegener, Fern Andra, Pola Negri, Ossi Oswalda, Emil Jannings, and Harry Liedtke. The rising star of the company became the actor Ernst Lubitsch who starred in a series of comedies for Union Film. Lubitsch soon also became a director. The position of Union Film was boosted when German government restricted the screening of non-German films because of the war. Davidson produced propaganda films at the request of the German Military High Command such as Das Tagebuch des Dr. Hart/Dr. Hart's Diary (Paul Leni, 1917). By decree of the German Military High Command, Union became a founder of the new government-backed conglomerate Universum Film A.G. (Ufa) in November 1917. Many of German's leading production companies were merged into a single organisation which would dominate German cinema for the next thirty years. So, the Nordisk's Union-Theater chain, as well as Davidson's Union were re-united under one roof. Davidson worked as the Ufa’s artistic director and head of production. Lubitsch and Davidson's films continued to fill the coffers of the Ufa. Now functioning as one of several production units of Ufa, the company made further propaganda films such as Der gelbe Schein/The Yellow Passport (Eugen Illés, Victor Janson, Paul L. Stein, 1918). 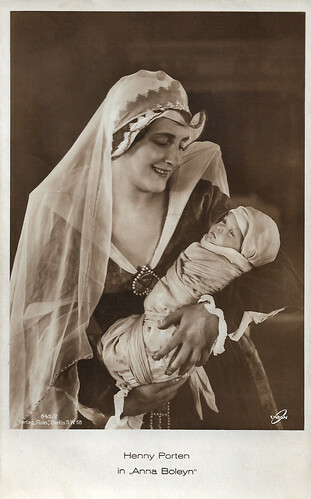 Germany's film industry boomed after 1918 and was increasingly artistically respected, partly due to the films produced by Davidson's Union production unit featuring Pola Negri and Emil Jannings, such as Madame Dubarry (Ernst Lubitsch, 1918), Sumurun (Ernst Lubitsch, 1920), and Anna Boleyn (Ernst Lubitsch, 1920). German postcard by Ross Verlag, no. 627/8. Photo: Union. Pola Negri in Madame Dubarry (Ernst Lubitsch, 1918). German postcard by Ross Verlag, Berlin, no. 635/3. Photo: Union. Ossi Oswalda in Die Puppe (Ernst Lubitsch, 1919). German postcard by Ross Verlag, Berlin. Photo: Union Film. Publicity still for Sumurun (Ernst Lubitsch, 1920) with Pola Negri, Paul Wegener and Jenny Hasselqvist. German postcard by Ross Verlag, no. 410/1. Photo: Union-Film. 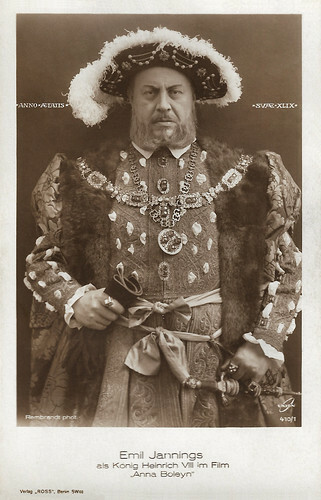 Emil Jannings as Henry VIII in Anna Boleyn (Ernst Lubitsch, 1920). German postcard by Ross Verlag, no. 645/2. Photo: Union Film. Henny Porten as Anna Boleyn in Anna Boleyn (Ernst Lubitsch, 1920). Davidson was unhappy with his subordinate position at Ufa. He made an attempt to buy back Union Film from Ufa, but this was rejected - partly because it was believed he was backed by the large Hollywood studios who wished to gain a foothold in the German market. Soon afterwards Union's existence as a notionally separate company was brought to an end. In 1920 Paul Davidson left the Ufa to produce Lubitsch’s Das Weib des Pharao/The Wife of the Pharaoh (Ernst Lubitsch, 1920) and Die Flamme/The Flame (Ernst Lubitsch, 1920) within the short-living Europäische Film-Allianz (EFA). When Ernst Lubitsch moved to Hollywood in 1922, Davidson had produced 39 films directed by Lubitsch. On 7 April 1921, Davidson resigned from his positions as production head and member of the Board of Ufa. Ufa lost its most successful producer, eventually finding a worthy replacement when Erich Pommer joined the studio after the merger with Decla-Bioscop AG in early 1922. After the failure of the EFA, Davidson founded the Paul-Davidson AG on 17 September 1924, producing films 'independently' within the Ufa. In the Spring of 1927, he cancelled his contract and entered a mental institution. It was not the first time he had experienced a breakdown. A few months later, on 18 July 1927, Paul Davidson committed suicide at the institution. Sources: Jan-Christopher Horak (IMDb), Wikipedia and IMDb.